A classy looking Strat with dual Wide Range humbuckers and a dual personality to match. Great if you have a standard Strat already and want more options. Nice build and finish. Neck coil-split on inside not outside (as specified). There's the usual alder body, hidden by an opaque polyester finish, and gloss untinted maple neck with a rosewood 'board bound with white plastic. The neck has a skunk stripe and headstock adjustment for the truss rod. "Far from being the first Strat with twin humbuckers, this new Strat HH is, though, one of the most stylish"
Far from being the first Strat with twin humbuckers, this new Strat HH - designed by the Custom Shop's Yuriy Shishkov - is, though, one of the most stylish. Body and headstock face are finished in Mercedes Blue, a dark blue with fine metallic flecks that in lower light looks like a black - you have to look closely to see the 'Stratocaster' logo on the big 70s-style headstock. The three-ply scratchplate is black-faced, although the inner white laminate gives that perfect inner outline. The chrome-covered Wide Range humbuckers look extremely classy alongside the chrome of the output jack dish and the two-post vibrato - there's a similar aesthetic at the headstock with the more angular buttons of the 'F' logo tuners. Not everyone will like the cream-coloured knobs, but they tie in with the pickup switch tip, not to mention the whiter fingerboard binding. Plugged-in, there's plenty of poke from either pickup, and in bridge position, after playing two new Classic Player Teles, we're wondering where our treble has gone. But no, it's there, it's just we have a darker, smoother sound - much thicker, too - that gives solid overdrive and certainly suits a three-piece; however, it might be too thick with another humbucking guitarist. The neck pickup is positively soupy and wide-sounding, less focused than a Les Paul. "Some of our favourite sounds here lie on the cleaner side of the tracks; there are some lush 60s sounds"
The single-coil split in position two (bridge) adds welcome cut, but avoids sounding overly sharp-edged; the neck split works slightly less well in that it's the inside, bridge-facing coil that's voiced here (the spec says it should be the outer coil). Without the protruding pole pieces on the low three strings they sound a little soft - it's the other way around on the bridge split, and that seems to work better, with a slightly softer response on the brighter top strings and a little more definition on the low three. Some of our favourite sounds here lie on the cleaner side of the tracks, however; there are some lush 60s sounds, and with a little volume roll-off that bridge single coil setting sounds really sweet with reverb and vibrato, not to mention a little Bigsby-like whammy action. And, incidentally, once you get the strings stretched, the vibrato is beautifully smooth and stable. This Strat HH would be a fun guitar to mod. Overall, it's a sleeper of a guitar, especially if you already own a more standard Strat and/or Tele but still haven't satisfied your Fender desires. On the one hand, it's a smooth tuxedo of a Strat; on the other, it loves huge, gained grunge. Some may see this as yet one more mucked-about-with Fender from a feature list that seems to come up with limitless outcomes without really bringing anything new to the table. And, to an extent, we'd have to agree, but - and this is the frustrating admission - it's so blooming desirable! 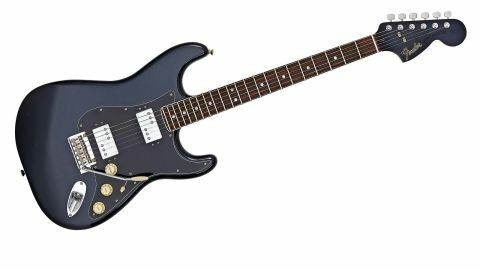 The Strat HH is, on paper, yet another 'Gibson' for Fender players; but those Wide Range 'buckers give it a unique voice that's equally at home for huge grunge-laden walls of sound or some 60s shimmer. Throw in aggressive street pricing, with excellent build and sounds, and we have one more Fender to tempt us.